Located ideally for a discovery of Provence, Luberon and Haute Provence, the house is located at the crossroads of 4 departments of PACA between Pertuis and Manosque, in the heart of the Natural Park of Luberon, 40 minutes from Lake Esparron ( Verdon), 35 minutes from Aix en Provence and 1 hour from Marseille. A lot of charm for this building dating back to medieval times combining authenticity, exoticism and comfort of today. It has its swimming pool, private entrance and garden in a forest area of almost 30 hectares. The owners, ourselves, live on site in a terraced building by one side not overlooked. The place is ideal for a couple or for a family with 2 children. The 110m² house has two bedrooms, one with two single beds and the other a double bed 140 cm. There is access to the private pool and garden from behind the building where the rooms and the bathroom are located. On the ground floor, you have a large air-conditioned living room of 25 m² with big screen TV, sofa 4/5 places a fully equipped kitchen and a dining area. Laundry, outbuildings and bike storage are also available for you side terrace at the front of the house. Two dining areas: one side shaded terrace of a trellis, charcoal barbecue, electric plancha on request, outdoor lighting. The other dining area is next to the pool. Table and 4 chairs with umbrella. 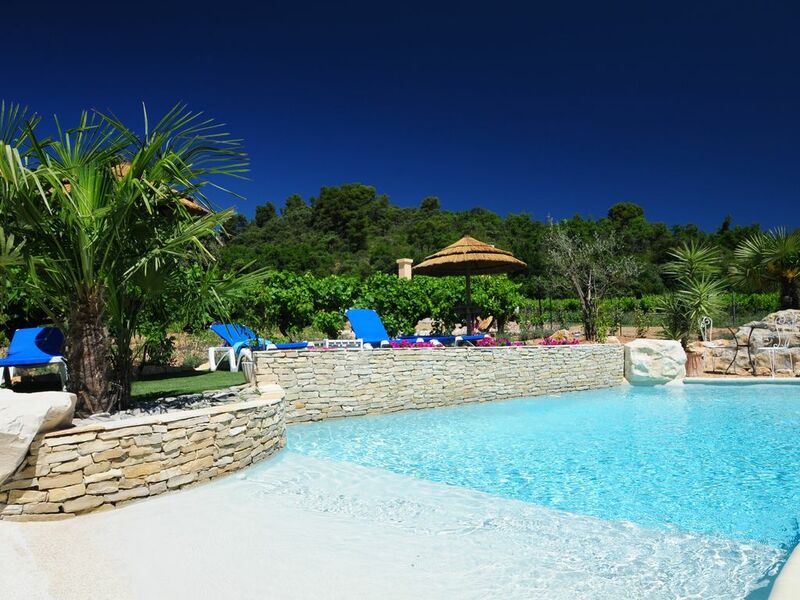 The landscaped pool, for exclusive use for tenants, is in operation all year round. It is at the back of the building overlooking a forest of oaks. Its size is 5 x 10 m and its maximum depth is 1m. 70. It is an original pool with a submerged beach and access by a few steps as well. Of last generation, it is treated with marine salts by electrolysis, without chlorine therefore. Its waterfall, its submerged beach and stone walls of the Luberon are an integral part of the landscape. The property is totally fenced with closed private parking inside the property. The garden with the pool has a total surface of 450 m². You can also play pétanque. On site not far from the property, you also enjoy private walking trails and acres of forest for walking. Our property is part of the municipality of Beaumont de Pertuis, a village of 1000 inhabitants, very picturesque, offering many marked footpaths and a cultural and historical heritage very interesting. Many brochures and documentation are available at the cottage. Do not hesitate to ask us also good addresses in the area, we will be happy to inform you. Pets allowed, WIFI access throughout the house by webtrotter. Deposit of 400 € to be paid on the spot returned under 7 days. 3-star Meublé de Tourisme classification since June 2011 issued by Tourisme Vert de Vaucluse. and Gite de France. Renewal: December 2018. See you soon in our medieval house. Photo report made in September 2018. Equipped with a corner bath and a shower head. Cupboards, 2 heaters with an electric ramp. Cosy with an exotic garden! We had a lovely couple of weeks at Beaumont de Pertuis. The weather was excellent and Veronique gave us lots of advice on places of interest and good places to sample and buy wine. The house was adequate for our needs and the garden was charming and a sun trap most of the time. WE have discovered an area that we will explore further. Many thanks Veronique for your kindness. Thank you very much Jane and James ! I am glad you enjoyed your stay with us and that you appreciated the area ! It was a pleasure to have you as guests at l'Oasis en Luberon ! Lieu à recommander mais petits bémols pas 'pratique' pour des personnes âgées escalier abrupte, température de l'eau de la piscine non chauffée mais super bien entretenue, un peu bruyant à cause de la grand route juste derrière la terrasse, mais la literie est très confortable, les installations sont bien pensées on ne manque de rien, le lieu est magnifique, la propriétaire (Véronique Jacques) est à l'écoute de tous vos besoins sans être omniprésente voire très discrète. Un lieu à recommander absolument une adresse à faire connaître. Des endroits magnifiques tout autour. Nous nous sommes super bien amusés. À refaire très vite. La maison est au milieu des champs, excentrée du village et pourtant pas loin des principales zones d'attraction: les villages du Luberon (Beaumon Pertuis, la Tour d’Aigues ,Gordes, Roussillon…) les lacs (exemple Lac de Peyrolles bien adapté pour les enfants et coin pique-nique abrité). Nous reviendrons certainement un jour avec plaisir. nous à l'Oasis en Luberon ! Nous sommes très heureux que vous avez pu apprécier votre séjour. Vous serez toujours les bienvenus sans aucun problème ! Excellente continuation ! Thank you very much Jon ! It was a pleasure to have you and your wife as guests. You deserved the standard of this house ! Please do not hesitate to come back either in this gite or somewhere else in the Luberon ! We would be delighted to see you again ! Cheers ! Wunderbarer Pool, 2 Terassen zur Auswahl, gute Ausstattung der Küche, sehr freundliche Vermieterin. Straße, die direkt am Haus vorbeiführt, hat manchmal etwas gestört. For lovers of hiking, there are a few hundred meters from the property of the official hiking trails of the Luberon. From our village of Beaumont de Pertuis 4 hikes can be done with difficulty levels. Notice to the amateurs! Otherwise, for golf enthusiasts, there is the Golf du Luberon in about twenty minutes. In addition, given our geographical location (on the borders of 4 departments of PACA), all known tourist sites are easily accessible by car. We can advise you on site and you also have many brochures at home.